Introducing the Age Checker App – Download it today! Calculating a customer’s age is one of the most important steps in “carding” customers of age-restricted products. That’s why we’re introducing a new technology solution to provide you with another option amongst a variety of tools to calculate customers' ages and make that critical “sell” or “do not sell” decision. 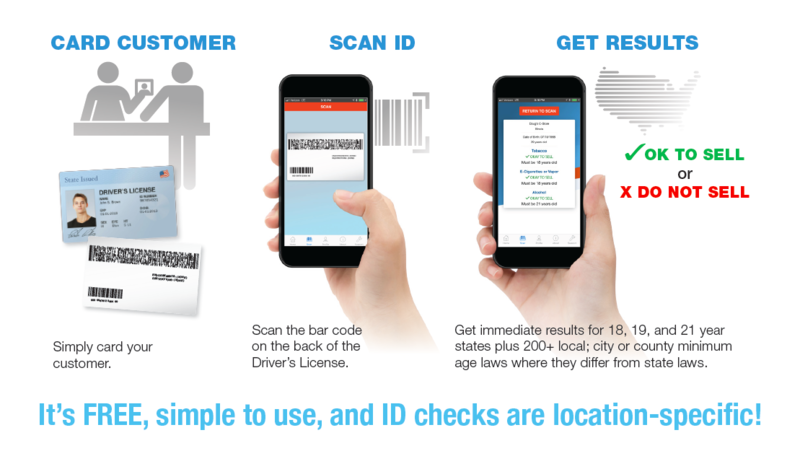 Our We Card Age Checker app provides scanning results based upon the known state or local minimum-age laws of 18, 19 or 21 years old. Set your store’s location, and it’ll provide scanning results for tobacco, e-cigarettes and vaping products, and alcohol. Check We Card’s listing of state and city/county minimum-age requirements. For example, if your store is in Chicago, 21 years old is the minimum-age, but in most of Illinois it is 18 years old. If your city or county is listed, then it has a higher minimum-age than your state. We update our list as soon as we learn of a change, but please contact us if we’ve missed your locale. Personal identifying customer information is not captured nor stored. Only the scanned ID’s date-of-birth, the calculated age of the customer and the “OK TO SELL” or “DO NOT SELL” messages for tobacco, vaping products and alcohol are displayed. Importantly, expired IDs display an “expired” message so you will know to deny any attempts to purchase age-restricted products since expired IDs are not considered valid IDs. When using the Age Checker app, a customer’s driver’s license should still be examined, especially the matching of the ID’s photo to the customer. And, just like any other tool, nothing is a guaranteed 100% effective solution, but it’s another compliance layer you can add to your overall effort to identify and deny minors’ attempts to buy age-restricted products. Consider dedicating a Smartphone at the cash register to scan IDs or allow employees to use the App on their own phones. When minors know you’re scanning IDs, word will get around quickly to other kids and you may see a decline in attempted purchases by minors. 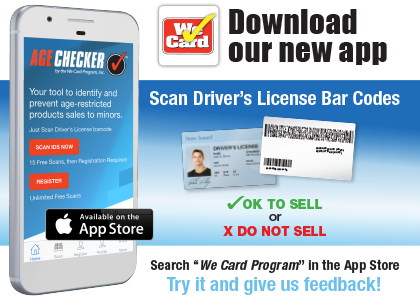 Download the We Card Age Checker App Today!